Heat 1 teaspoon oil in saucepan over medium-high heat. Add onion, carrot, and garlic to pan. Sauté 5 minutes or until onion is tender and carrot begins to brown. Stir in broth, quinoa, salt, and cinnamon; bring to a boil. Cover, reduce heat, and simmer 20 minutes or until liquid is absorbed. Remove from heat. Fluff with a fork; keep warm. Heat remaining 1 teaspoon oil in a nonstick skillet over medium-high heat. Add apple to pan, and sauté 7 minutes or until apple begins to brown. 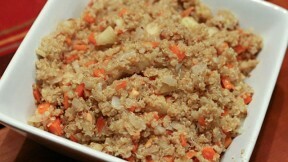 Add apple, almonds, and pepper to quinoa; toss to combine. Serve warm.